Happy 2016! 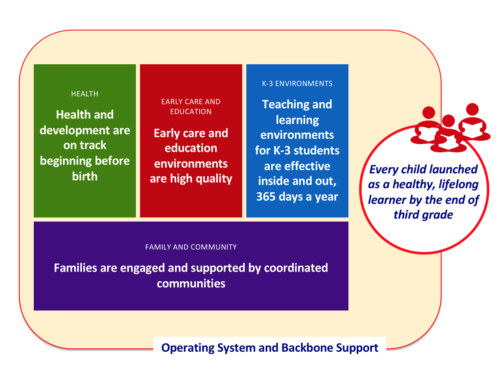 As we start this New Year, it’s a good time to take stock of how well we’re all working together to launch every child in Nash and Edgecombe counties as a healthy, lifelong learner by the third grade. In order to achieve this outcome, we have to build a strong foundation for grade-level reading proficiency. This means we must work across four main building blocks of literacy: healthy growth and development starting before birth; supportive families and coordinated communities; high quality early care before kindergarten and effective learning environments for all K-3 students both inside and outside the classroom, 365 days a year. Research shows that proficiency in reading by the end of third grade enables students to shift from learning to read to reading to learn. Most students who fail to reach this critical milestone falter in the later grades and often drop out before earning a high school diploma. Healthy growth and development. Help every child and family have access to health insurance and a healthy active relationship with a doctor and a medical home to support their family. If you need help finding insurance call 855-733-3711 to find a navigator near you or go to GetCoveredAmerica.org/Connector. Contact your doctor or DEPC and ask about Ages and Stages, a screening tool that can help parents learn about their child’s development and how to best support them. Finally, visit our web site to find the latest version of DEPC’s Places to Play and Grow map, which also has information from the FIT (Families Involved Together) Parent Group for suggestions about how to have a productive well-child check-up. Family and Community support. Commit to learning one new strategy to build and strengthen parental resilience, either your own or a parent you know. Schedule down time for yourself. Take a walk! Reach out and connect with other families in your neighborhood – schedule a playdate or join a playgroup! Join a group that supports families like All Pro Dads at your child’s school. Have a technology-free night. Read together once a week. Visit a new park together. Reach out to other parents with similar age kids and support each other. And remember that it is a sign of strength to ask for help. All of these things can make a big difference – even if you just focus on one, you are doing something great for both you and your child. If you are looking for more support or ideas, the Partnership has a whole variety of workshops and resources from Triple P tip sheets to support groups and seminars. Contact our Family First counselors for any ideas and help at 252-985-4300. Early Care and Education. Resolve to do a quality assessment of the environment your child is in every day, whether they’re at home or in child care. Are they active enough? Are they eating healthy foods? Are they in a language rich environment? Are they building strong social and emotional skills to cope with life’s challenges and foster positive relationships with others? If your child is four and will be going to kindergarten next year, make sure you register them early and look for opportunities with the elementary school they’ll attend that will help them have a smooth transition. Effective leaning environments for K-3 students. Success at the end of the third grade is not just about test scores or having a great teacher in a great school, although these are essential. High quality activities after school and in the summer to enhance and extend learning need to be available for every child throughout our community. Extended learning resources also help build healthy, social and emotional skills and relationships. Research shows extended learning is necessary for most children to become proficient readers. Begin now to plan for the summer. It’s fast approaching! Extend the learning after school and beyond for your child. These resolutions are achievable, especially if we work together at home, school, in our businesses, neighborhoods, and with our faith-based partners. As always, DEPC’s Family First Counselors are a phone call away, 985-4300. We’ve come a long way already, but the time is now to redouble our efforts to make sure all children are proficient readers by the end of the third grade. Please mark your calendar for Week of the Young Child, April 10-16. The theme for the week is “Happy, Healthy Hopeful Children”. We will launch a Grade-Level Reading Campaign with events that will focus on the building blocks of literacy mentioned above. We hope you will join us for the Children’s parade, a Party in the Park, Story time at the Library, Tour of a Healthy Kid Zone or for the annual State of the Child Luncheon on April 15th. Sponsorship opportunities are still available!